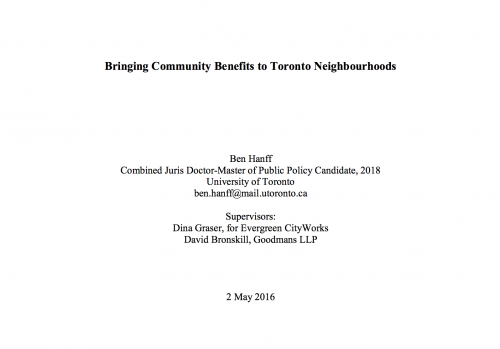 This paper provides a legal overview and analysis of how community benefits and Community Benefits Agreements (CBAs) can be used in the Toronto land-use planning context. Community benefits help maximize the positive social and economic impact of infrastructure and real estate development projects. Through engagement with affected communities, benefits are negotiated that can include local procurement, workforce and hiring opportunities, and improved services and facilities. This engagement can also increase the potential for local support for developers’ projects. While community benefits and similar tools have had great success in the United States and Scotland, they are just beginning to take root in Canada. This paper proceeds in three sections. The first section overviews Ontario’s hierarchical planning framework and City of Toronto planning tools. The second section looks at the potential of these tools – specifically site plan approval, development charges, zoning, and s. 37 – to secure different types of community benefits. The final section analyzes two clusters of policy options to encourage community benefits and CBAs: amendments to the planning regime and a range of potential City-initiated incentives.